A classic in wood and FRP. The Oberlerchner Mg 19 Steinadler (English: Golden Eagle) is an Erwin Musger designed two seat tandem trainer glider built in Austria and first flown in 1951. 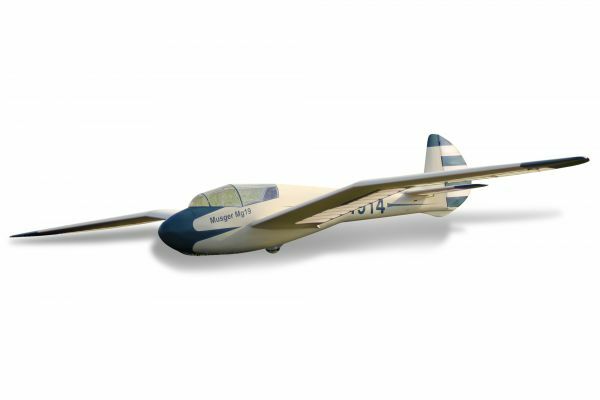 Several examples of this successful aircraft, which competed in the two seat class at two World Gliding Championships in the 1950s, were still flying in 2000. A total of 46 have been built. Today there are still a few airplanes around impressing enthusiast for oldtimer gliders. This kit is as close as possible to the original. It has a wingspand of 7.8m. The wing consists of 4 wing panels giving the model its unique look. The wings are fully build to detail and sanded. The wings are ready to cover. Tomahawk took this route to offer the modeler the opportuntity to use his prefered covering method. The wings are equipped with fully functional double sided airbrakes. The fudealge is made of FRP to make the handling easier. It can be devided for transport services. The fuselage is full painted. Related links to "Musger Mg 19a Steinadler 7,8 m Kit"